I have a little treat for you today! *Edited 1/2015: I can’t stop making these little guys! I always try to have a stash in the freezer for when a chocolate craving hits. Since I make them so often, I took some updated pictures for you guys to show you how pretty they really are! These little guys are so delicious. I’ve been eating them for dessert for the past couple of weeks. They have to be stored in the freezer because they’re made with coconut oil and they start to melt pretty quickly at room temperature. To make them even tastier, I’ve packed them full of delicious add-ins like almonds, pistachios, chia seeds, pumpkin seeds and Craisins! Simple to make and perfectly portioned for a nightly snack or dessert! In a small bowl, combine the coconut oil, honey and peanut butter. Microwave for 30 seconds and stir. Add cocoa powder and chia seeds and mix until well combined. From here you have two options: Divide mixture into 12 muffin tins and top with remaining ingredients OR add remaining ingredients to liquid mixture and then portion into muffin tins. Pretty simple, right? 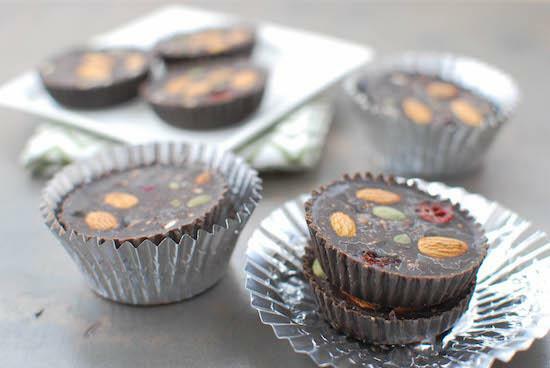 The first time I made these I just mixed the nuts, seeds and fruit into the mixture and then scooped into the muffin tins. The second time, I wanted them to look prettier so I added the nuts and seeds on top. Either way is fine! These are totally customizable. 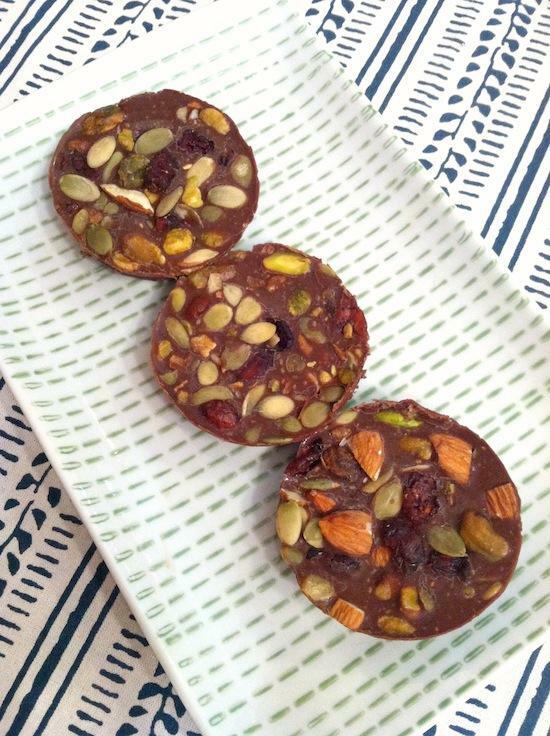 Use your favorite nuts, seeds and dried fruit to make them your own. What mix-ins would YOU use?! Yum! I love that you mixed the chocolate in with the peanut butter! I have a strange obsession with combining cereal with dessert (it’s great mixed in ice cream, yogurt, cottage cheese, smoothies, you name it!) so maybe some plain puffed rice or puffed millet, or some crushed up Puffins! i think that’d be a perfect add-in! these look fantastic!! i would def do pumpkin seeds, dried blueberries, and i’m not sure what else! love the dried blueberries idea! Replace the PB with AB and I’d be ALL over these. And for my mix ins, I’d probably do something like chocolate chips, raisins, banana chips, and maybe even a sprinkle of oats or crispy rice cereal to add an interesting texture. oooh like the rice cereal idea! kinda like a crunch bar! These looks so good! I love that you used coconut oil and cocoa. I echo everyone else – you are so creative in the kitchen! I love it! Def. making these soon! What a great idea! These look delicious. Yum! These mix ins look pretty much perfect to me 🙂 I might add dried banana slices though! These look delicious…and I love the ingredients list! 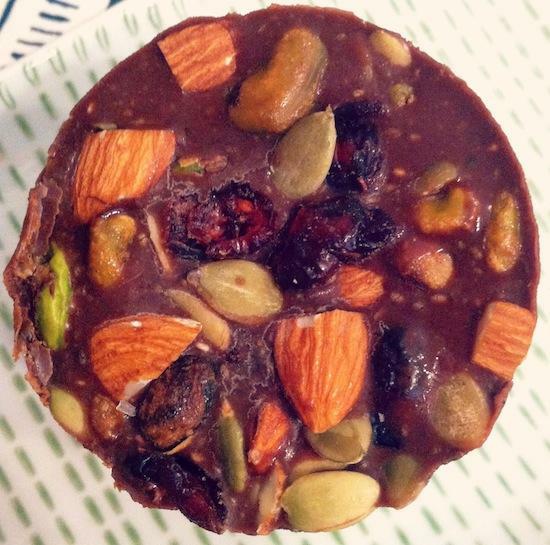 Once marathon training is over I can’t WAIT to have time to make holiday goodies like these! Yum! I’d definitely add some coconut. Oh my gosh! So easy and so yummy! The possibilities are ENDLESS! Wow, I would never think of something like this on my own, so thank goodness for blogs! I probably would keep the nuts and seeds, but take out the dried fruit. Thanks for sharing! Oh love the looks of all that chunky goodness. There’s something so satisfying about nuts and cranberries. Perfect combo of flavors and textures. PB and chocolate is literally my favorite combination ever! These sound awesome and I love all the nut additions. it’s the best, isn’t it?! i think it’s worth a shot! I assume you did not need to line the muffin tins with anything? Or spray/coat them? Probably not necessary…? if you use the recipe i use, i think the coconut oil helps them form a hard shell and i just traced around them with a knife and then slide a knife down one side of the muffin tin and they popped right out! 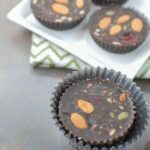 These sound AMAZING, and I love that they contain healthy add-ins like seeds and almonds!! I would definitely add cashews or pistachios! Only thing is… they've kinda stuck to the tin. A lot. Aka I had to squish one to get it out, and now I'm afraid of the ruining the others lol! I think that’s probably because the coconut oil is a crucial ingredient for these! They form a kind of hard shell that makes them pop right out. OMG! These look amazing. As soon as my whole life challenge is over and I can eat honey again I am making these bad boys! Oh my gosh those look good. If I were to take out the honey, should I replace with agave, or would it work without either? i think they need a little sweetener so i think agave would work just fine! Yummy! Just discovered I have a coconut sensitivity… but I love to use coconut oil. What do you think I could sub for the coconut oil? Thanks! yum, I am making these, probably right now! I just made the receipe and it was delicious! Thanks for sharing. I didn’t have craisins or pistachios but I had everything else. The only problem I had was getting the PB cup out of the muffin tin. hmmm did you use the coconut oil in the recipe? I think that’s what helps them come out of the tins. I let mine freeze all the way and then gently traced around the edges with a knife and kinda pushed it down one side of the muffin tin and they popped right out! Yum, for once I have all those ingredients at home! Even better- its heating up here in Australia so frozen treats sound perfect! 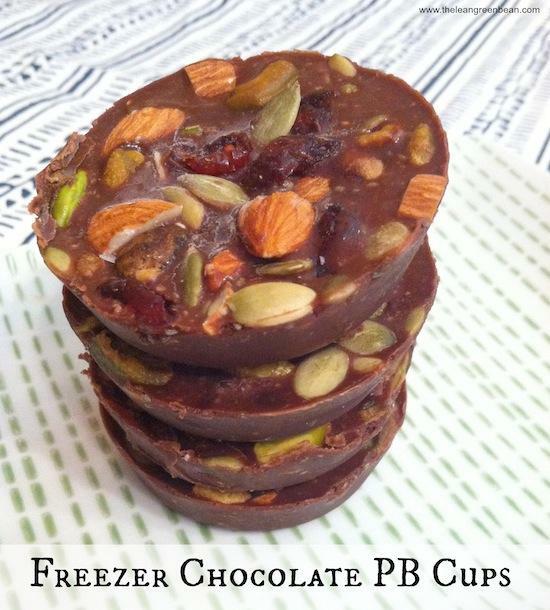 I’ve made frozen sunflower butter and chocolate fudge before and definitely want to give these a try! I love the idea of adding in some nuts and dried fruit for added texture and flavor. I think I’d want to add goji berries and coconut to mine! oooh goji berries! Great idea! To say I’m obsessed with these is an understatement. I love that you used honey to sweeten them, too! 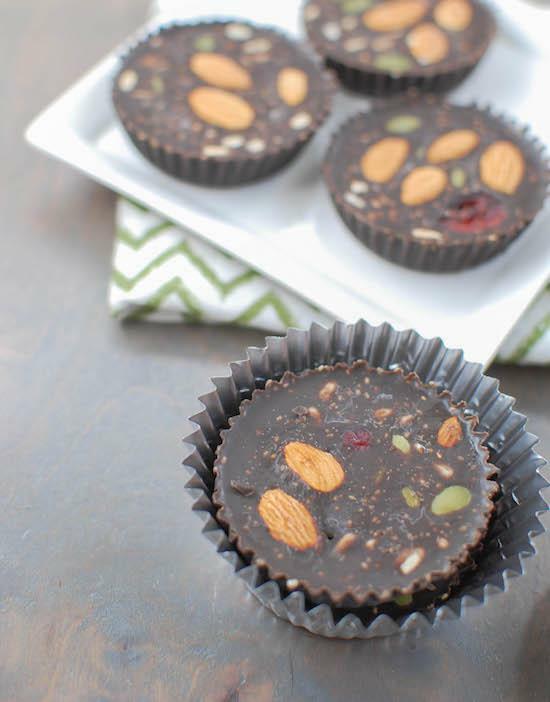 Totally trying them with pecans, almonds, chia and craisins. Youdda bomb, lady! I probably should not read your recipes when I am hungry–um–yum!!! Adding this to the long list of things to make. hope you enjoy them Elena! YUMMMM!! I just made these & they are out of this world delicious! Kids agree! I used chopped up dried cherries instead of craisins as that’s what I had. My only problem came when trying to remove them from my muffin pan (I used a mini muffin pan). They were impossible to get out without ruining them. Bummer as they looked so pretty! I even had sprayed the pan with coconut spray before adding the mixture. I used your sprinkling technique for the toppings. So next time I will try cupcake liners & see if that works better. Any tips? Hmmm, i have no idea. If you used the coconut oil in the recipe and sprayed…they should pop right out. I just poured mine in without spraying, let them freeze all the way, then traced around each circle with a knife and then kinda pressed the knife down the side of the muffin tin and the pb cup popped right out. Hi Lindsay, thanks for your reply. One thing I was thinking was it could possibly be because I used a mini muffin pan so they weren’t as thick as a regular muffin pan? The 2 that came out the best seemed to be the ones I had put more “batter” in. Either way, these things are so amazing I will definitely be playing around with ways to get them to work better for me. Anything that takes literally 5 mins of work & produces such amazing yumminess is worth it! I do wish they would hold up better in a lunchbox tho so I could have sent some to school w my kids…sitting in the freezer right now they are tempting me! Also forgot to mention that the chia seeds give it such a great crunchiness, a real candy bar like feel. loved the texture of them in these. ahhh yeah, that could be it! let me know how your experimenting goes! I wish these traveled better as well. Um hi, these look AMAZING. I have done something similar with almond butter instead of peanut butter and they are great too. I used less coconut oil, too. Your pictures are lovely! These sound delicious! I might try chopped dried apricots, too. Do you have nutrition info on these — or even just calorie count? Is there a substitute for coconut oil? unfortunately not in this recipe. It’s a key ingredient that helps them harden and stay the right texture and pop out of the muffin tins. These look amazing. Pinned em for your event too! Finally whipped these up yesterday after having them bookmarked for months! SLAM DUNK! awesome!!! so glad to hear it! I made these last night and they were fantastic! I didn’t have any almonds or pistachios, but next time I will plan to have them on hand. Thanks for a great recipe! [WORDPRESS HASHCASH] The comment’s server IP (66.155.38.68) doesn’t match the comment’s URL host IP (76.74.254.120) and so is spam. [WORDPRESS HASHCASH] The comment’s server IP (207.198.101.83) doesn’t match the comment’s URL host IP (76.74.254.123) and so is spam. [WORDPRESS HASHCASH] The comment’s server IP (192.0.82.135) doesn’t match the comment’s URL host IP (76.74.254.120) and so is spam. [WORDPRESS HASHCASH] The comment’s server IP (192.0.83.90) doesn’t match the comment’s URL host IP (192.0.81.250) and so is spam. [WORDPRESS HASHCASH] The comment’s server IP (66.155.8.59) doesn’t match the comment’s URL host IP (66.155.11.238) and so is spam. [WORDPRESS HASHCASH] The comment’s server IP (184.168.27.102) doesn’t match the comment’s URL host IP (50.63.101.1) and so is spam. [WORDPRESS HASHCASH] The comment’s server IP (184.168.27.100) doesn’t match the comment’s URL host IP (50.63.101.1) and so is spam. [WORDPRESS HASHCASH] The comment’s server IP (192.0.82.87) doesn’t match the comment’s URL host IP (192.0.78.12) and so is spam.